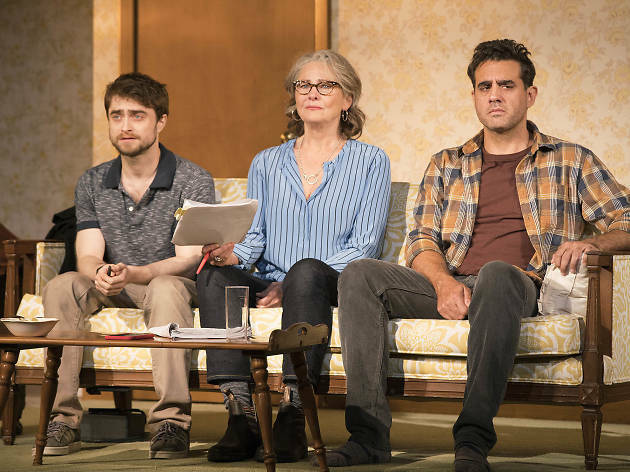 Daniel Radcliffe's aim is true in a new play about the stories we tell. The Lifespan of a Fact is billed as “a new play based on a true-ish story,” and there’s a lot of history built into that qualification. In 2003, creative nonfiction writer John D’Agata wrote a quasijournalistic essay about the suicide of a teenage boy in Las Vegas. After Harper’s Magazine passed on it, the piece wound up at The Believer, where in 2005 a fastidious fact-checker named Jim Fingal took objection to numerous literary liberties that D’Agata had taken in the story. The resulting tug-of-war dragged on for years (D’Agata’s piece was finally published in 2010), and the two men reproduced their voluminous correspondence in a 2012 book. Now that book has been adapted, by a team of three writers, into a quick and entertaining play that makes a good case for the value of truth—even as, in telling its own story, it takes generous advantage of dramatic license. Moved to the present, with a highly compressed timeline and an important composite character—a magazine editor played by Cherry Jones with her characteristic focus and measure—The Lifespan of a Fact takes pains to present both sides of its central conflict. For D’Agata (Bobby Cannavale), accuracy can be sacrificed in the interest of “the central truth of the piece” (and in the service of literary effects like sentence rhythm). For the hypermeticulous Fingal (Daniel Radcliffe), a veritable facts machine, any deviation from the strict truth is a violation of journalistic integrity and, by extension, a threat to the social order itself. At the performance I attended, one particularly righteous speech in defense of veracity received a round of applause, which may reflect the current political mood as much as it does the persuasiveness of the argument he offers. If Fingal gets the upper hand in The Lifespan of a Fact, it’s partly thanks to Radcliffe’s appeal as an actor. His Fingal may be a persnickity fussbudget with a dubious sense of which battles to pick, but his bite is the bite of an underdog; he’s scruffy and small, and his hyperintensity reads as passionate integrity that doesn’t know how to contain itself. Cannavale’s D’Agata, by contrast, is arrogant and dismissive, and his resistance to Fingal’s critiques has an undercurrent of vanity and pique. (Whereas Fingal presents reams of hard evidence, in sometimes comical excess, the playwrights give D’Agata only a few philosophical arguments.) Like most issue plays these days, this one ends on a note of ambiguity, but I suspect that most people in the audience will have made up their minds by then. It may be a problem when you can’t see the forest for the trees, but if the trees aren’t real, can you even call it a forest? Studio 54 (Broadway). By Jeremy Kareken, David Murrell and Gordon Farrell. Dir. Leigh Silverman. 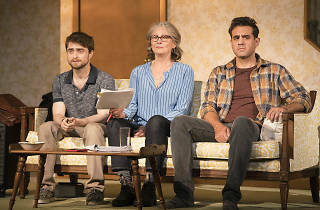 With Daniel Radcliffe, Cherry Jones, Bobby Cannavale. Running time: 1hr 25mins. No intermission.